Do you remember seeing a dish for the first time and instantly falling in love with it? I vividly remember one such experience that I had when I first saw my mother’s cake stands. She had several ones that were all beautiful in their own way, but the one that instantly caught my eye was her Fostoria cake stand. I am lucky that my mother has gifted me this specific cake stand so that, as she said, I can make cakes for her now! Another one of my favorites was given to me by Jo Spruiell. This stunning stand has intricate etching all over, with three dainty birds carved into it. It truly is a timeless piece. After my mother introduced me to cake stands, I began to build my own collection. Throughout the years I have amassed many cake stands, each with their own unique charm. My collection contains some old and some new, but each one carries its own special meaning. One of my more recent acquisitions is this white stand accented with acorns. When my husband, Neal, and I got married, we adopted acorns as the symbol for our family. Acorns are a motif that is carried throughout our home in various ways. This cake stand is one of my favorite ways that we incorporated acorns into our décor. There is a cake stand for every season and occasion. Crystal stands are perfect for formal occasions, while basic stands can be used for everyday baking. An endless variety of cake stands is available in every style and price range. Starting a collection is a wonderful way to carry on a family legacy and pass a love of baking through the generations. Phyllis I absolutely LOVE your new Acorn cake stand! I’ve told my children when they purchase serving dishes to make sure the border is beautiful. When we place food on or in our serving dishes, the border will be the frame for our gift of food. Your acorn cake plate has one of the most beautiful borders I’ve ever seen on a cake plate in my life! When we love to collect, how can we create more space for displaying these collections? Sometimes I wish I had a large separate room just for collections. I hope that you and your readers have some good ideas on how to stretch space to display the treasures we love. I love cake plates too.I bought a pink depression one at an antique shop.I also have a wire one with four plates,one for each season.It is kept out all year for fruit,cookies etc.The grandchildren love to see what I have for them. I love your acorn cake stand! I have always loved acorns. How fun to find out they mean strength and growth. When I was a young mother, my mother brought me a birthday present of an exquisite glass cake stand with a lovely decorated birthday cake on it. It was such a fun present and I cherish the cake stand to this day and think of her when I use it. 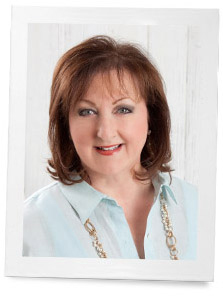 I enjoy your blog so much and I love the gracious, inspiring posts that show us that living beautifully is still alive and well! I have several beautiful crystal cake stands but my favorite is a wooden one turned by my dad. It’s a lovely wood turned with love. I miss him every time I see it. I love my cake stand with dome, but I cannot eat cake often (hardly ever) and keep my figure! Recently, I have started using it to store bananas, peaches, apples or other fresh fruit. Sometimes I will store a loaf of whole grain dark, unsliced bread with pretty seeds and grains on top. It looks pretty on my counter and I get to use my cake stand and dome relatively guilt free! I have acquired a few cake plates and so many have fond memories of the person who gifted me the plate. I more recently received one with a dome. My Fostoria plate is like yours that I received as a wedding gift. You brought back precious thoughts and appreciation. I too love cake stands!! Mom gave her two daughters and daughter-in-law a Fostoria cake plate for Christmas one year and she made sure all the grand daughters got a Fostoria cake plate when they married. Sweet memories. I love cake stands, but only have a couple. Once, in a pinch, I needed extra stands, so I tried an idea I had seen somewhere before. I used short crystal candlesticks and upside down teacups for bases, placing a little reusable mounting putty on top of each one, then placed a plate on top of the putty. Voila! Instant cake/dessert stand. I do this all the time now and am never short of elevated serving pieces. I can also mix and match patterns to match the table décor. It looks wonderful and afterwards when I disassemble each piece, I don’t have to worry about storing the stands. When my daughter and son-in-law were married, almost three years ago, they decided not to have a traditional wedding cake. They preferred a dessert table with a myriad of delectable offerings. So…..I went on a hunt to collect all the cake stands and platters I could find! We borrowed my mother’s milk glass one, which was so special to have at the reception, and I found another lovely milk glass one with ruffled edges at an antique shop, plus a round purple glass one, square white pedestal one, as well! Now my daughter has several to entertain with! My mother has a Fenton milk glass cake stand that I love and hope to own one day. I have the best memories of that stand. I can picture our favorite cake on it, the black midnight cake from her 1961 Betty Crocker Cookbook with white icing. It was so pretty on that stand and so delicious too! I have a beautiful cake stand that belonged to my grandmother. I remember my own mother using it when I was little. My mother passed away when I was in high school and when her kitchen was being broken up, because my father remarried, I did not want any USED stuff. I remember thinking that when I get married I want everything brand new. Well, thanks to my very thoughtful sister-in-law the cake stand and a set of dishes were kept for me. My sister-in-law kept the box of these priceless items with her every time she moved until one day when I did marry she passed them on to me. Being so young when my mother died I did not realize what a treasure this cake stand and the dishes would become. My sister-in-law unfortunately is no longer a member of the family but I love her just the same. Thank you Carol for thinking of me those long 54 years ago. a very sweet story. And it so true that we don’t appreciate these things until we get older. My husband and I received three cake stands for our wedding 44 years ago. I remember thinking at the time “When am I ever going to use three cake stands?” We were moving into a small apartment and beginning careers, and living a spartan life style. We contemplated finding new homes for them. Now, I am so thankful that my mom suggested that she tuck them away for me , and when we moved into our first home, I began a love affair with baking, decorating, and entertaining. Over the years I have added to my collection and I use them often, but the ones I treasure most are the ones my mom lovingly saved for me. Thanks, Mom, and thanks Phyllis, for the memories. Enjoyed seeing your cake stands. Have collected twelve over the years, finding them here and there. If they could only talk! Would love to know who had them before and the family celebrations and tables they graced in the past. Mine are used primarily at Christmas, as I stack them and place sugared fruit, “sugarplums” , on them. Got that idea from Martha Stewart’s Christmas book from many years ago. So pretty and fun to do with children. Thanks for sharing your collection, Phyllis. So beautiful. I also noticed the beautiful Hardanger cloth, Phyllis and have the same question as Wanda. And it is such a lovely way to display your cake stands. I’m also needle worker and had the privilege of learning this stitching technique a number of years ago. I love Hardanger. It is so wonderful to create a beautiful piece, but this is one Mom purchased for me. She too is a very accomplished needleworker and spies great things. Phyllis, your collection is exquisite! You have so many beautiful pieces and I was wondering where you store these beautiful treasures. Do you have a dish pantry of sorts? I have a cabinet where I stack my cake plates, except for the Fostoria. It has its own place. I have three one was a wedding present, one was a small pink stand to use at easter, and the third one is a quiche plate. Clear, pink, milk glass, all have been used over the year’s to celebrate or just for fun. How lovely…..pink is fabulous isnt it? Thank you for sharing your beautiful cake stand collection. When we moved into a garden home, nice sized, but much smaller than the house we left, I had to choose my favorite things and the cake stands I chose have been used a frequently for a number things. A three tiered clear crystal stand with tiny wreathes of leaves in satin finish in each tier. The other is smaller, blue and white floral patterned china with three tiers. 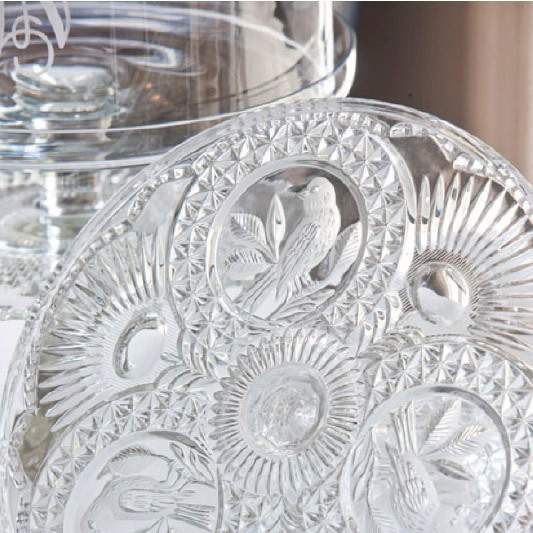 When camellias or gardenias a available the crystal cake stand had enough slope toward the center to feature them in the living room where everyone who comes in can enjoy them. The blue floral is great for the cinnamon toast I used to serve to one grand daughter whom I call Rosebud because of her pale, golden red hair and rosy completion. Because I mixed the butter, sugar and cinnamon into a smooth frosting before spreading it on the toast triangles, she called it Granny’s Gourmet Cinnamon Toast. I used my neat little Delft tea set for the grands children’s tea parties, supplemented with my collection of demitasse. At Christmas the crystal cake stand becomes a tree filled out with clear Christmas tree balls and small bows of silver or sheer, wired ribbon bows to center under my dining room chandelier between my Fostoria Fishtail Candlesticks. Simplifying and sizing down are difficult, but with imagination and plenty of candles and ribbon many lovely accents can be made. You ideas are great. Thank you for sharing with us. These are absolutely stunning cake stands Phyllis. I too have a collection of my own. They really do add so much to the presentation of the dessert being served. 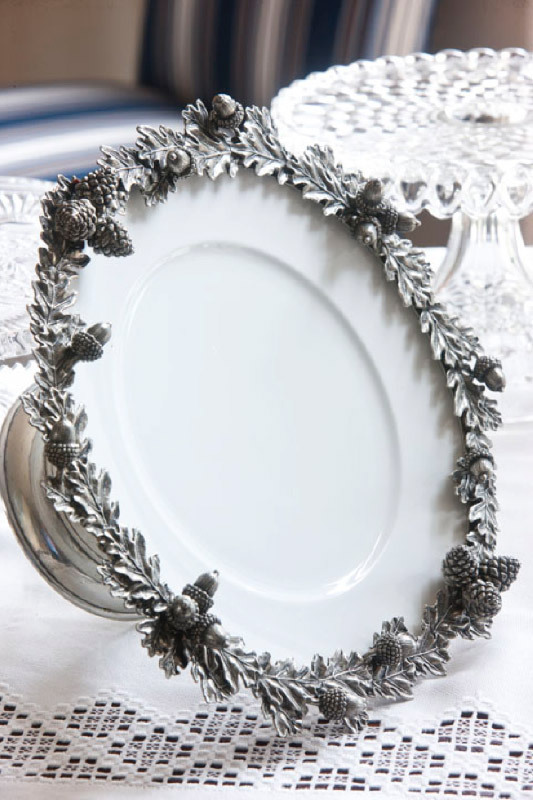 I still have a vivid memory of one of my mother’s cake stands that had a silver antique base but the top was glass,etched in silver with leaves…my mother always used that one for her nut crescent cookies,dusted with powdered sugar. They looked magical all nestled up on the cake stand. 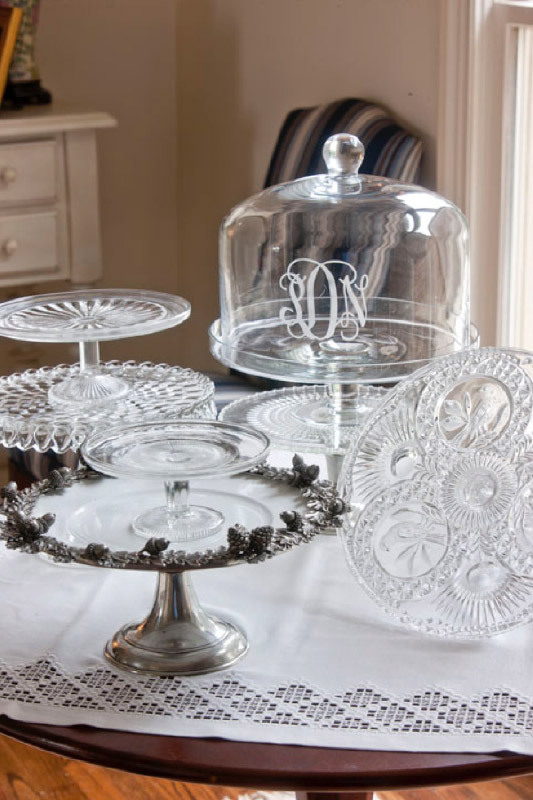 I also use my cake stands for other things…I have an all glass one in the kitchen that holds my fruit, a white square one for cloth napkins, and at Christmas, I put my ornaments on my glass ones and do a flip-slide so I can put the dome cover on. But then again, cakestands can look beautiful all on their own too. I too love cake stands. I have several & recently added a beautiful American Fostoria one to my collection. It is square & I love the way it picks up the light & sparkles when displayed. Such treasures! I was thrilled when Mom gave me her cake plate. My sister got the matching goblets! We both are lucky. I know your parties are stunning!!! One added benefit of collecting cake stands: You can stack them on shelves and store cups or other small items on them. Of course that makes more room for other cake stands! Thank you for sharing this collection with us! Love the white cake stand with the acorns. Truly beautiful. Neal bought that for me at Shirley Pewter in Williamsburg. I just love it…acorns and oak leaves are our thing. It means strength and growth. I started collecting cake pedestals years ago. I use them for every birthday celebration and have used them for many dessert parties. Nothing is prettier than an array of cakes displayed on different pedestals. Great for stacking too when height is needed on a table or for different desserts. I love them too. I love how it elevates the food to an extra level of beauty. Your collection is beautiful, Phyllis. I think that is how I became an antique dealer, I never met an antique dish or cake stand I didn’t at least like, and most, I love! When the cake stands and dishes threatened to over-run our home, I started selling. Cake stands are such a special way to showcase a beautiful dessert, but they are also wonderful in guest bathrooms piled high with rolled up antique guest towels and fragrant soaps, as a summer centerpiece with a shell collection and much more. And is that your hardanger, Phyllis? Did you do it yourself? I’ve done just a little. It is so beautiful. Yes it is….I have done hardanger in the past and love it, but this was a find! My mom found this in an antique store and purchased it for me. What a lovely gift. I have never seen the edge finished like that, more of a hem rather than the needle work to the outside. My husband’s father came from Norway and I was introduced to it when we visited there in 1973. Thank you so much for showing it to us, and also for your reply.